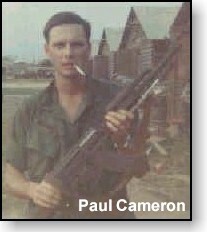 Sp4 Paul Cameron served as a tower guard with Admin Company at Di An base camp until the division re-deployed back to Ft Riley, Kansas in 1970. The 11th ACR (Blackhorse) came into Paul's area and resumed operations in and around Di An. He was re-assigned to USARV in Saigon area for the remainder of his tour. Paul lives with his wife, Cherri, in Sainte Genevieve, Missouri. He is retired, having served as high school guidance counselor with the Coulterville School Unit District #1 in Coulterville, IL. 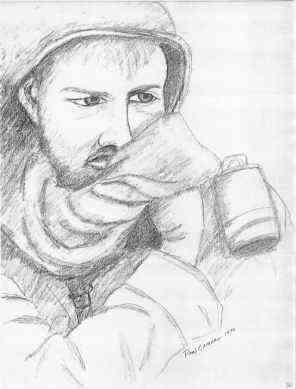 Paul has contributed his pencil drawings and poems. 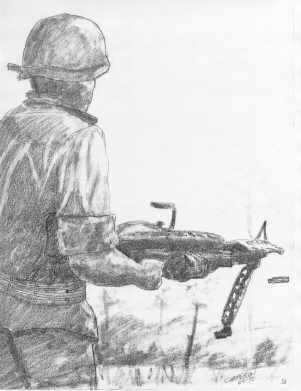 Self Portrait - FNG in full combat gear at Di An 1969. 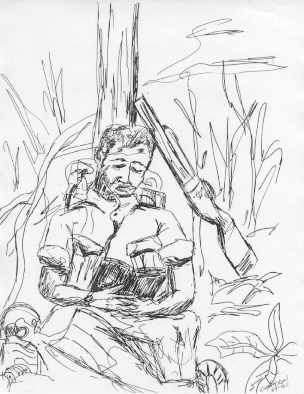 Portrait Sketch - Vietnam 1969. 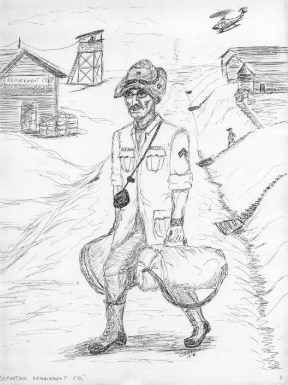 Walking Patrol - Northwest of Lai Khe 1969. Taking A Break - Highway 13, 1969. 1st. 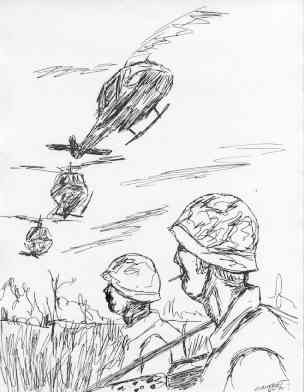 Aviation Battalion Hueys - Recovering patrol Northwest of Di An, 1969. Cool Down - Mechanized infantryman cools down with wet towel East of Ben Cat, 1969. 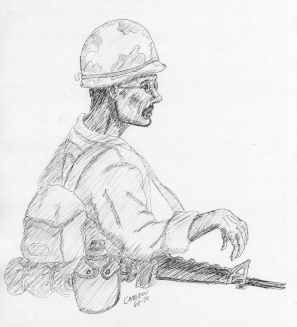 M-60 Machine Gunner - B Co. 2nd. 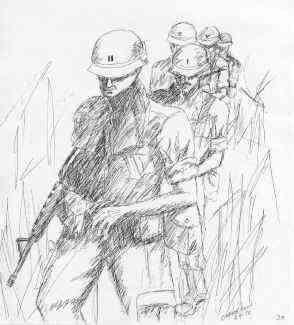 Battalion, 18th Inf. West of Lai Khe, 1969. 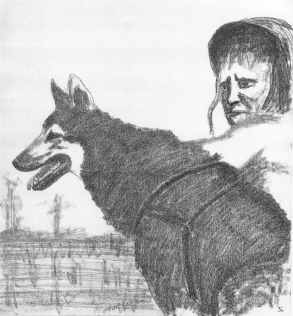 Dog Team - 1st. Dog Platoon around Lai Khe, 1969. 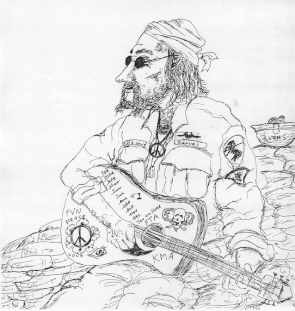 Blackhorse Hippie - 11th ACR Trooper playing guitar on Di An bunker, 1970. 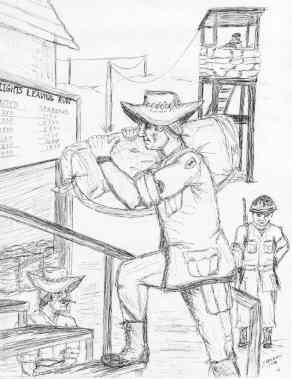 Leaving For R&R - Long Binh, 1970. Big Red One Going Home - to Ft. Riley, Kansas, 1970. Words to songs make us think as we sing. We just want to live and we do give a damn. Take care of business and forget about the cows. Is this a dream or are we going insane? Names are called out and we're on a plane. Loaded on buses to Long Binh sixty in a group. One is always insulting the other's mother. I'm really here . 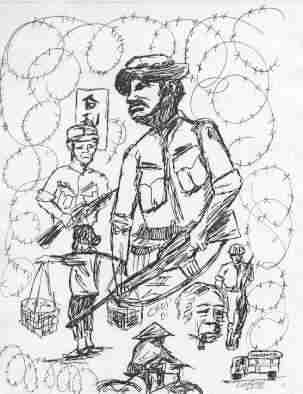 . . in Vietnam. Some have already died crying out to "Mom"
Voice from the crowd yells, "Go die in Nam!" Homeward bound to forget Ghosts of Vietnam. New guys asking, "What's it like here in Nam?" A steel pot sitting on boots and reads, "Short!" Marvin the ARVN blew it for Uncle Sam. A volunteer or "luck of the draw"
What awaits everyone just up ahead? Back to base camp . . . thanks to choppers on the way. A good night was sweating with the shakes. Steve Branch, the grunt from Paragould. Tears in his eyes about pain and horror. Bits of metal easing out of his skin and head. The grunt from Arkansas grinned from ear to ear.